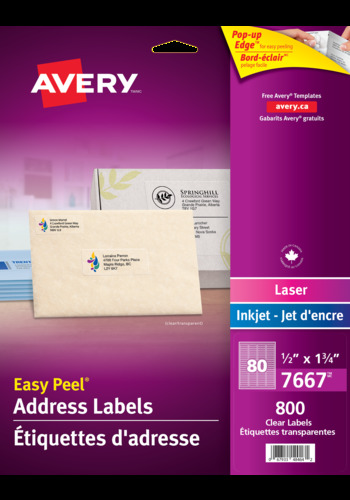 with Easy Peel® for Laser and Inkjet Printers, ½" x 1¾"
Mail out envelopes with a clean, printed-on look and complete high-volume mailing projects quickly with Avery® Clear Address Labels with Easy Peel®. Clear permanent labels will deliver an impressive and unique finish while getting letters out the door quickly. Mail out envelopes with a clean, printed-on look and complete high-volume mailing projects quickly with Avery® Clear Address Labels with Easy Peel®. Clear permanent labels will deliver an impressive and unique finish while getting letters out the door quickly. Easy Peel® label sheets with Pop-up Edge™ lets you peel and stick labels in a snap. Just bend the label sheet, peel your label and apply— it's that easy. These dual technology labels offer guaranteed printer performance with both laser and inkjet printers. Great for colourful or textured envelopes, gift tags, jars, bottles, and glass products. Create your own designs or use the free pre designed templatse from Avery® Design and Print Online software to combine names, addresses, logos and even barcodes into one-of-a-kind label designs. Give envelopes a professional look to impress everyone on your mailing list. Labels virtually disappear when applied to white or coloured paper or envelopes. Achieve a professional printed-on look and add clear labels to envelopes for special occasions, gift boxes, personalized tags, glass jars for unique gifts, organizing boxes and more. Create unique labels to impress everyone. Ideal for special occasions, weddings, holiday greeting cards, invitations, thank you cards, mailers and more. Add logos, images or graphics on address labels for a creative or professional finish. Add images or designs for creative gift boxes, glass jars, sticker projects, festive holiday tags, scrapbooks, and more. Create easy-to-read labels for long-term storage boxes to identify goods.